Although what you wear to a funeral is important in showcasing your respect for the deceased and his or her family, it’s equally important to pay attention to your hair. As is the case with any semi-formal gathering, it’s the overall image you present that determines how appropriately attired you are—so take a few minutes to ensure that your hair matches the rest of your ensemble. Men rarely have to do much out of the ordinary for their hair at a funeral, although it’s always a good idea to take an extra moment before you head out the door. If you have short hair, your regular style (as you would wear it to work) is usually sufficient. Avoid too much product or over-styling your hair (such as you might if you were going out to a nightclub). Don’t wear a hat of any kind. Men with long hair may want to pull it back in a ponytail. Facial hair should be trimmed and neat. Any non-traditional styles (a mohawk, spikes, extensive coloring) should be downplayed. Other than these basic steps, men are typically free to style their hair in a way that suits the general mood and tone of the funeral. 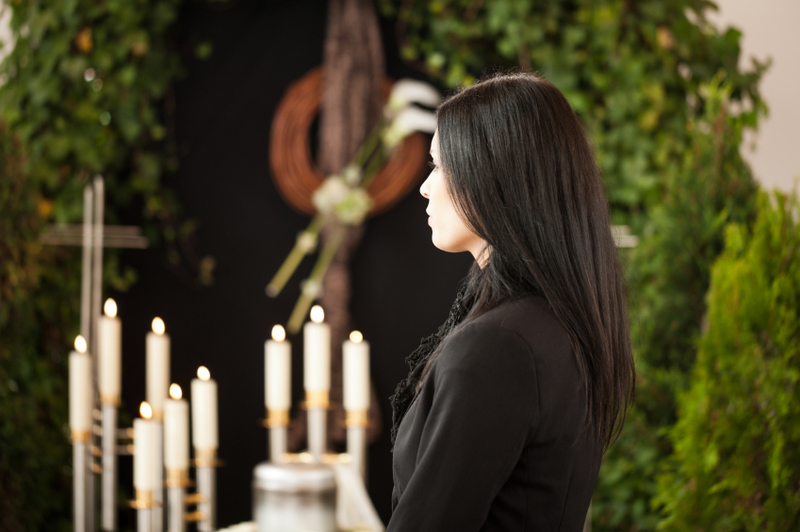 Women tend to have a more difficult time than men styling their hair in any kind of situation, and funerals are no different. As is the case with general funeral attire, business casual is usually best. Women may wear their hair up or down, as long as it is neat and tidy. Classic, more old-fashioned hairstyles tend to work best at a funeral. Avoid ostentatious hair clips or anything too floral/glittery. Hats may be worn for an outdoor funeral, but they should be somber and unobtrusive. If any of the memorial service takes place indoors, you may be asked to remove your hat, so prepare your hair for that possibility. Although dark veils might evoke a feeling of historic mourning, try not to look too costume-y. Play down bright colors or extreme hairstyles for the day. Kids tend to get more leeway when it comes to what to wear to a funeral, and their hair is no exception. As long as you avoid cutesy hairstyles with elaborate decoration, they should be fine. Neat ponytails or pigtails work well for little girls, and most boys can get away with whatever style they already have. What you wear to a funeral isn’t as important as the overall impression you give. There’s no need to wear all black, and you don’t have to break out the black hat and veil. As long as you look tidy, respectful, and downplay any extremes in your normal appearance, you should be just fine.